Here, memory stumbles, and we rewrite the past, float through the surface of history, what it must have surely been like, galleries of lies and obsessions, a piñata of subjectivity cón lenguaje de sentimentalismo. Castillo promises an exploration of imperfect memory intersecting with the subjective and sentimental interpretation of history, and her book delivers. Told in three parts, this collection of poems reads as though the reader is flipping through a personal photo book from the Cuban speaker’s past. Ekphrastic descriptions and allusions to photographs from her childhood home in Cuba and her exiled adolescence in Miami are juxtaposed with stories of the roles her parents and grandparents and tías and tíos (aunts and uncles) played in the Revolution, as well as her own journey back to the homeland decades later as an adult. As a result, the whole collection reads as a series of vibrant snapshots, providing the reader with an intimate glimpse of Cuban life during this tumultuous time of transition. airmail envelope, like a cloak. a stranger, a skeleton of whom I might have been. She acknowledges that the trip to Florida and her settlement abroad has alienated her from her homeland, and forced her to grow into someone different than she may have been if she had stayed in Cuba. In yet another poem, when she goes back to visit Cuba, the speaker revisits this idea of nonbelonging, and notes how she and her family are greeted with suspicion, “Other, “aquí, / en nuestra tierra natal” [here, in our native land]. Both in the United States and in Cuba, Castillo’s speaker is “Other.” No matter where she resides, she does not belong. 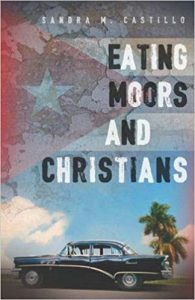 Eating Moors and Christians explores the many ways Cubans may not belong, and how these varied circumstances often bring an undercurrent of fear. This fear often manifests in Castillo’s poems with a recurrent aversion to water and concern about not knowing how to swim, or of the violence of men. She uses vibrant similes like “an engine that exploded / like a violent husband” and “he grabs me, squeezes me, / as if picking tropical fruit” to illustrate the severity and nuance of the conflicts faced by Cubans, even in their own culture. Braided within these intensely personal vignettes are snapshots of how Cubans made do with life on the island, as well as how claimed Cubans, those with relatives who sponsored them in the US, like the speaker, made it to America yet continued to look back toward the homeland. In the title poem Eating Moors and Christians, which is nestled in the third and final section of the book, Castillo’s speaker describes a reenactment of La Reconquista over a meal of white rice and black beans, noting that they (the rice and the beans) are “cooked together until the rice is brown, mestizo”—deliberately using the Spanish term for people of mixed heritage to draw the connection between black Moros and white Cristianos. Here is the heart of Cuban people and of the book: a mixture that creates something new. I photograph it all with Catholic grief, our mosaic of sin and guilt, this slow blur into the past, mourn the loss, todo lo perdido, in this, the city of my dreams where everything and nothing has changed. Toward the end of the collection, the speaker confirms: “I am a camera, dedicated flash.” Indeed, she is. In this collection, Castillo has captured the Cuban people, cuerpo y alma, as they were, as they are, and as they will be. Leslie Salas is a multimodal writer-poet-cartoonist whose work can be found in The Southeast Review, Rogue Agent, SmokeLong Quarterly, and more. She serves as the graphic nonfiction / poetry comics editor for Sweet: A Literary Confection and pays the bills teaching writing to university students. She edited the Other Orlandos anthology (Burrow Press, 2017) and Condoms & Hot Tubs Don’t Mix: An Anthology of Sexcapades (Beating Windward Press, 2018). She blogs at TheGloriaSirens.com and posts on Instagram as @Leslie_Learns.